Winter’s been long for many people. Snow and freezing temperatures have been the norm for some over the last few weeks. All of that adds up to one thing: It’s time for a vacation. Ladies, don’t be mad that this blog is for men looking for a mancation  there will be another blog for you. So guys listen up and think about coming to Edisto for a get away with your best bros. This time of year is perfect for a trip to Edisto with just the guys. It’s warm enough to get out on the boat and do some fishing and chilly enough to build a fire in the fireplace. Here are the top five things that men can find to do on Edisto Beach now and any time of year. The Plantation Course is the only golf course on the island. The 18-hole course takes players through Edisto’s unique terrain, which features ponds, lagoons, woodlands and salty ocean breezes. Plus, it’s standard for the wildlife in the area to make a cameo right in the middle of a game. Many times herons, egrets, deer and alligators come out of nowhere just to let people know they’re hanging around. But don’t worry, nobody has ever been bothered by any of the creatures  just don’t get too close. Anything golfers need from a six-pack to a cart rental is available in the pro-shop. Plus, Grover’s Bar and Grill is located right next door to the pro-shop, so don’t hesitate to stop in for some appetizers or a full meal. Catching dinner doesn’t mean running out for pizza  it means actually catching dinner. Edisto is the perfect place for dropping a line off front beach for some fish or taking some rotten chicken necks out to the creek to scoop up a dozen or so crabs. Fishing can be done right off front beach and generally results in some pretty good action. Many times fishermen get a shark on the line, but remember to throw those back. Check out http://www.dnr.sc.gove/fishing.html for more information about what’s in season and catch and release laws. Crabbing is possible on front beach as well as long as crabbers come with a crab cage filled with bait, rope, and an empty milk jug to mark the pot. Fill the crab cage with some bait  the more rotten and foul-smelling the better- walk it out chest-deep during low tide, and let it sit until low tide rolls around again. Keep in mind that the tides will move the pot a little. Check the pot any time by wading out into the water and pulling it up by the string. If any crabs come up with an orange underbelly, let them go  that underbelly is roe and will turn into tons of baby crabs in the near future. Another way to go crabbing is to head down to Store Creek right off Highway 174 by the Old Post Office Restaurant. Go during low tide (tide charts are available for free at the Piggly Wiggly). Tie some rotten chicken necks to a string with a small weight attached and drop them into the creek. Sometimes it is easy to see the crabs come and nibble at the bait, others times you’ll have to rely on the tugging of the string. Use a net to scoop up the crab and toss them into a cooler filled with ice. Bring home your catch and cook as soon as possible. Several captains in the area offer deep sea fishing charters for both the novice and experienced. These charters take groups out in the Atlantic anywhere from a few miles out to 20 miles out so fisherman can try their hands at catching the big boys out there. Fontaine Charters is run by one of Edisto’s oldest families. 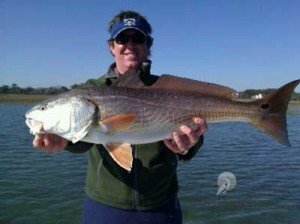 Charter trips range anywhere from a non-fishing two-hour trip of Edisto’s waters to a five-hour trip full of deep sea fishing. Whiting, trout, sharks, King Mackerel, Black Seabass, and all kinds of bottom fish can be caught on these charter trips. Call 843-869-3446 to book a fishing charter. It doesn’t ever get all that cold here in Edisto, but the water does get a little bit on the chilly side. However, it’s almost always possible to get in the water with a wet suit on. While Edisto never really gets the traditionally huge waves that surfers seem to flock to, it does offer some pretty awesome conditions for body surfing. When the weather’s warm, the ocean is a great place to play a game of catch in the water or just relax in a tube with a cup of your favorite beverage. Plus, for the guys out there who aren’t married or otherwise involved, setting up a game of beach volleyball or some bocce ball is a good way to look busy in the sand while scoping out chicks. Edisto has just a handful of bars and restaurants, but they’ve all got some nightlife action, especially in the warmer months. Whaley’s offers karaoke on Mondays, Coot’s Lounge has ping pong and pool (and is the only beach front bar on the island), the Dockside has a screened in porch in addition to its indoor scene, which is excellent for hot summer nights, the Thirsty Fish is right next door to the Dockside and has views of Big Bay Creek, and all feature two of the most important things: beer and liquor. Live music can be found at these bars at least once a week. The crowd varies at each place depending on the time of year. Summer is, of course, the busiest time at the bars. The winter months offer slim pickings in terms of a crowd, but that’s to be expected around here. Regardless of how packed the bars may or may not be, the bartenders and managers are generally down for some good conversation. Check out the rentals available on this site to score a house on Edisto Beach. This time of year is less expensive than the upcoming summer months, so now’s the time to book a bargain getaway. Just remember  if you’ve got a wife or girlfriend at home, bring home a souvenir or you’ll never hear the end of it.